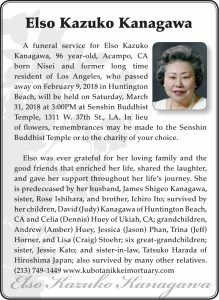 A funeral service for Elso Kazuko Kanagawa, 96 year-old, Acampo, CA born Nisei and former long time resident of Los Angeles, who passed away on February 9, 2018 in Huntington Beach, will be held on Saturday, March 31, 2018 at 3:00PM at Senshin Buddhist Temple, 1311 W. 37th St., LA. In lieu of flowers, remembrances may be made to the Senshin Buddhist Temple or to the charity of your choice. Elso was ever grateful for her loving family and the good friends that enriched her life, shared the laughter, and gave her support throughout her life’s journey. She is predeceased by her husband, James Shigeo Kanagawa, sister, Rose Ishihara, and brother, Ichiro Ito; survived by her children, David (Judy) Kanagawa of Huntington Beach, CA and Celia (Dennis) Huey of Ukiah, CA; grandchildren, Andrew (Amber) Huey, Jessica (Jason) Phan, Trina (Jeff) Horner, and Lisa (Craig) Stoehr; six great-grandchildren; sister, Jessie Kato; and sister-in-law, Tatsuko Harada of Hiroshima Japan; also survived by many other relatives.